The head of Egypt's Supreme Constitutional Court (SCC) and ex-interim president Adly Mansour turned down a ‎request by President Abdel-Fattah El-Sisi to join the parliament, ‎Mansour told reporters on Tuesday. The newly elected parliament should pass all laws ratified under Mansour and ‎El-Sisi within 15 days of its first assembly. The spokesman for the SCC, Ragab Selim, dismissed on Monday media rumours that Mansour had accepted the president's offer and that he would be attending on Tuesday a hearing for some cases filed before the SCC. Mansour's rejection comes after several MPs told ‎parliamentary correspondents Monday that Mansour ‎would be on the list presidential appointees. Sayed Farrag, a pro-Sisi MP ‎from Cairo's Hadayek El-Qubba district, told reporters ‎that a large number of MPs urged El-Sisi on ‎Monday to appoint Mansour in the coming ‎parliament so that he could be the speaker of the House ‎of Representatives – or Egypt's lower house parliament. El-Yazal told reporters on Monday night that "the pro-‎Sisi bloc would wait until the names of presidential ‎appointees are announced to announce a decision about ‎its favourite candidate for the post of the speaker. The speaker of Egypt's new parliament will be required to ‎tackle a number of key issues, at the top of which is ‎whether parliament, according to Article 156 of the ‎constitution, should vote on more than 400 laws passed ‎by the president since ‎‎2013 in a matter of 15 days.‎Some of these laws were passed by interim president Mansour. 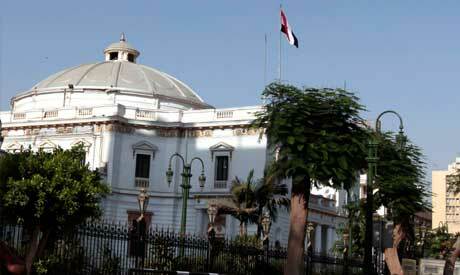 On Tuesday, MP Anwar El-Sadat, chairman of the ‎Reform and Development Party, asked the Supreme ‎Constitutional Court to give a final binding opinion on ‎how Article 156 should be implemented. It's about time Egypt steps away from the 15th century to the 20th and appoints more women in senior government positions, Let's not ask too much and join the 21st century. The only snag is there are no female army generals yet to choose from; these roles are only limited to the incompetent inner circles!